1% Dragonfruit makes the Fuji and CDS taste more like a danish with cinnamon apple filling. 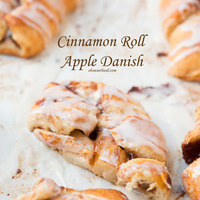 Without it, this just tastes like a cinnamon danish with apple slices on top. This recipe is the property of ID10-T and released under the CC Attribution-NonCommercial-Sharealike 4.0 license. You may not copy, derive or commercialize this recipe without following the terms of this license or the explicit permission of the creator. If I had a go to profile that I could probably vape the rest of my life, it would probably be an apple/cinnamon combo. It was one of the first profiles that really hooked me when I started vaping and nothing has changed. /u/ID10-T 's recipe is absolutely delicious, and I'm glad I finally got around to mixing it. Not everybody like's the taste of Dragonfruit, but man it really makes Apple/Cinnamon Combo's sing, and this recipe is no different. It's sitting in my U-Well Fancier right now and I can't get enough of it. I remember not liking the juice in the beginning, even after 3 weeks steep time. The other day I found a 30ml bottle that I've mixed almost 3 months ago in one of my boxes. Gone in 2 days. I Mixed another 100ml straight away. Can't wait for it to be done steeping. :D This juice really needs time to come together, give it that time and it will blow your tastebuds. So, so, so good. Thank you for sharing! I love this stuff, I mixed this up almost a year ago when I first started diy. Decided to mix this up again and it's a really great combination with the CDS and Fuji. This is a great recipe, thank you. I have mixed this up multiple times now, and I am always carrying some with me. The flavors are balanced really well. Awesome recipe, thanks for sharing! I wasn't sure how the dragonfruit would be but everything comes together perfectly! This is a solid recipe. Real smooth, with a good fruit:danish balance. Very light on the cream note, it just sort of smoothes out the apple component. Light enough to be an all-day liquid, but the flavor does not fade after repeated vaping. Great recipe! Thanks for sharing!